With that, Johannes and I joined forces on an informal, internal project at IDEO; our goal was to integrate quantitative research methods into the traditionally qualitative landscape of work that the firm is known for. While we saw the tremendous benefit that clients were getting from ethnographic research, we wanted to do more. We started by building smarter surveys. Surveys aren’t often thought of as a way to inspire design. They are generally pretty dry and written in a kind of robotic language that is appealing to a researcher seeking scientific rigor, but their disconnection with the real person responding to questions means that that person is likely not really paying attention or being thoughtful with their responses. Surveys also usually focus on opinions and demographics, which are useful for some purposes, but those kinds of responses don’t usually help uncover opportunities for developing new kinds of products or services. We don’t know what people really want or need if we only know what they like and where they live. By asking smarter questions about people’s behaviors, attitudes, and needs, we are able to uncover places to develop truly useful new offerings. Also, by learning from hundreds or thousands of people at a time, our design teams and our clients can all feel more confident about what we’re learning. As our research approach solidified, our team grew to four. We sequestered a weird attic space at our Palo Alto studio as our headquarters, and set to work codifying our research approach, which had been dubbed Hybrid Insights. We worked in the moments between projects, after work, and on weekends. 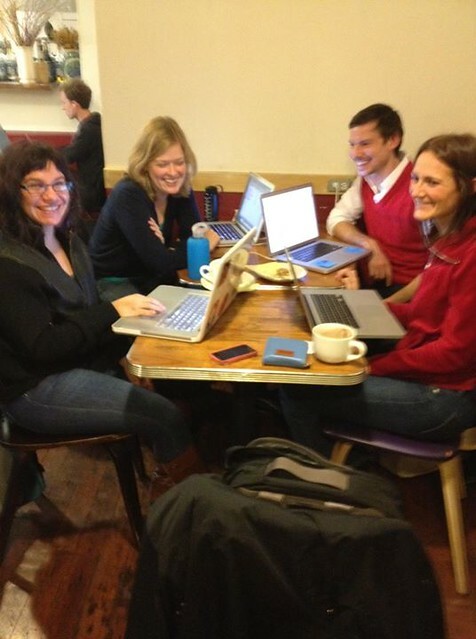 The team, hunkered down in a coffee shop in San Francisco, on a Sunday afternoon. From left to right: Alisa Lemberg, Juliette Melton, Johannes Seemann, Silvia Vergani. Three years later, Hybrid Insights is a core component of many of the projects we do at IDEO. Hybrid projects have happened or are starting in our San Francisco, Palo Alto, Boston, Chicago, Singapore, and Munich studios. Our core team is growing, and our network of collaborators spans the globe. At IDEO we help our clients innovate; this experience of helping IDEO itself innovate has been remarkable. Whether you call it a lab, or skunkworks, I’ve learned how supporting a small group of people with a vision can yield enormous benefits for organizations and individuals.